The secret to making a prefabricated home really special, is to harness the natural features of the site. This doesn't just mean bringing sunlight and beautiful views into the interior, it also means integrating the environmental benefits of passing heating and cooling into the very structure of the home. 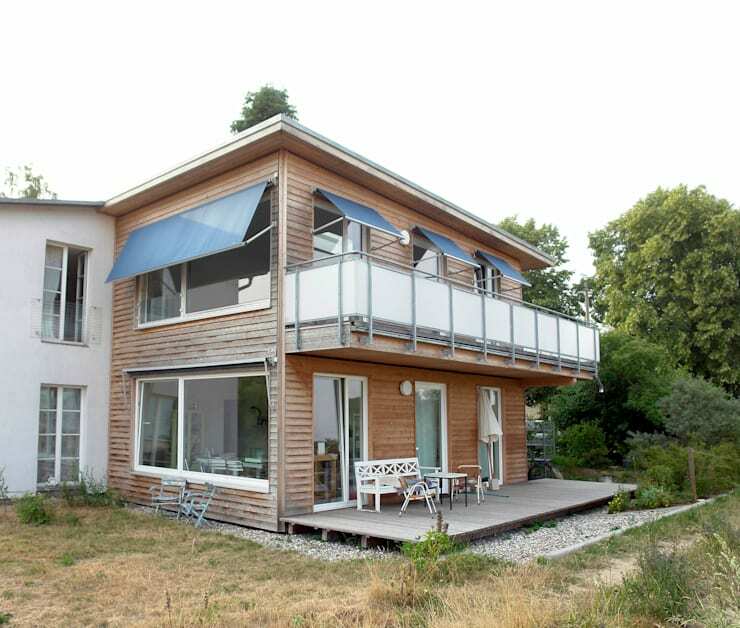 The home has a solid, friendly exterior with large glass doors and a big upper terrace or balcony. The design is fairly straightforward until you notice the ever so slightly sloping roof. This adds a sort of careful, beachy feel to the home. Note the simple deck on the lower level too. 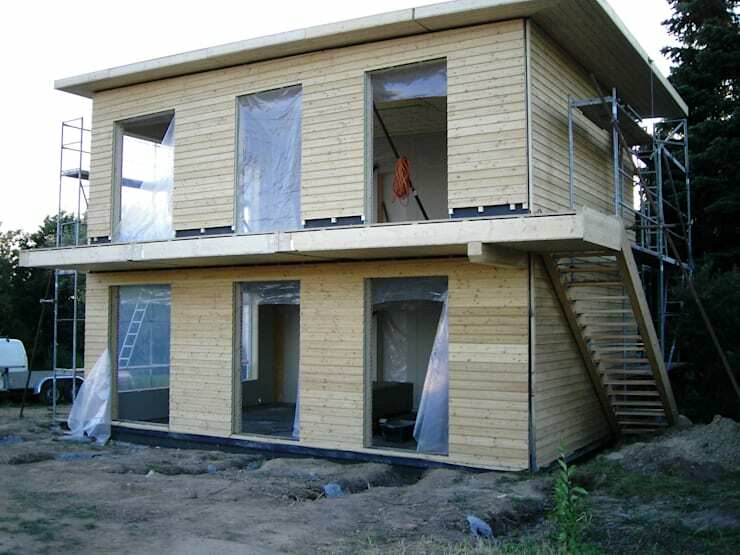 Like all prefabricated homes, this one is mostly constructed off-site and assembled very quickly on-site. This helps eliminate costly delays in construction and helps minimise potential damage to the surrounding area. There is a very high level of precision in these kinds of homes that makes them extremely sturdy and stable for years to come. The home has some huge windows that really absorb lots of light. The abundant sunlight helps heat the home during winter and in summer, there are some huge awnings to help prevent the home from overheating. 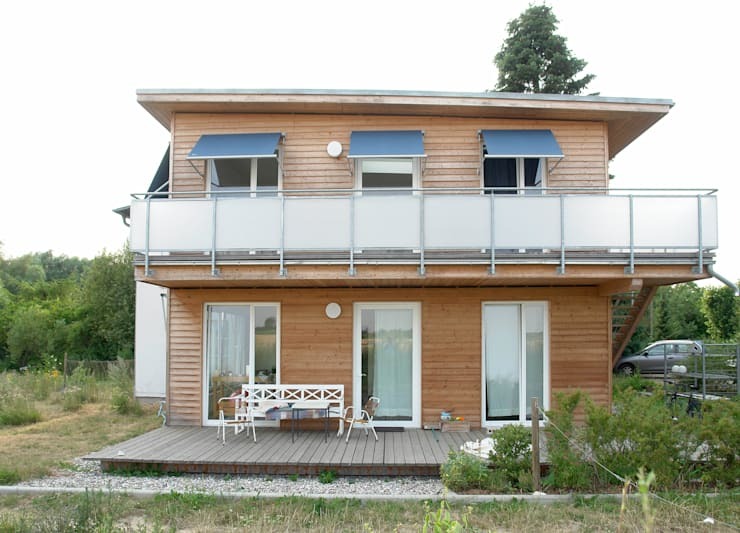 Awnings like this can have a huge impact on the rate of heat absorption in a home. The interior materials can be modified to suit the tastes of each individual owner, but the basic design is perfectly pleasant in itself. 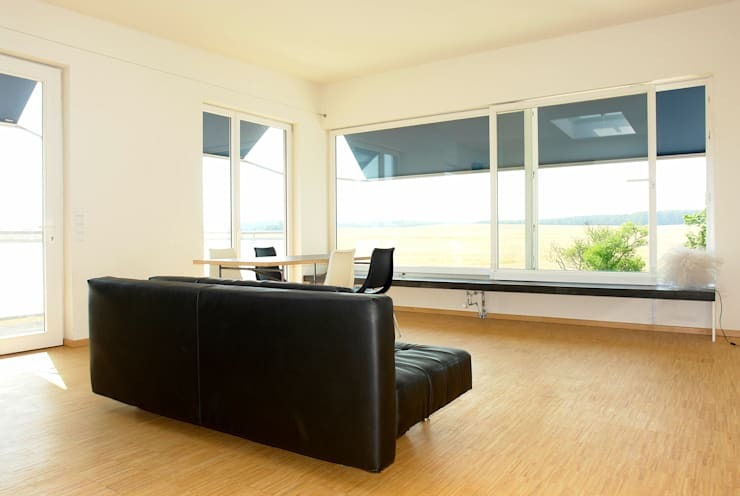 The biggest advantage here is that the large windows invite that exterior view into the living room and make it a really essential part of the interior decor. Nature, in a sense, provides all the decorative appeal you might need. The ground floor is designed with one big combined kitchen, dining and living area. The master bedroom comes off to one side and the ensuite bathroom can be accessed from the main living area and the bedroom. The layout is simple but cleverly designed so the window views really remain centre stage. The upper floor has a second living room with space for a grand piano. 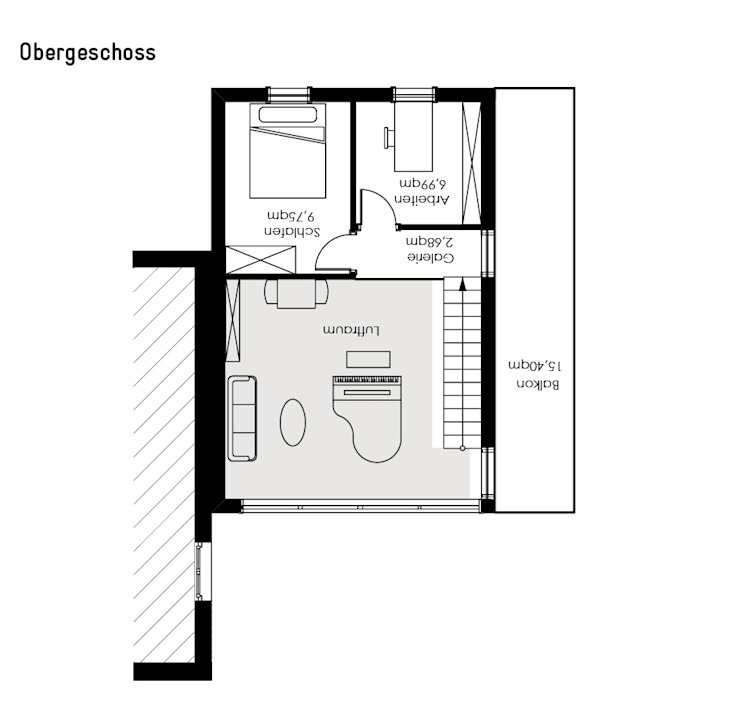 It also has a second bedroom and a study that overlooks the terrace. 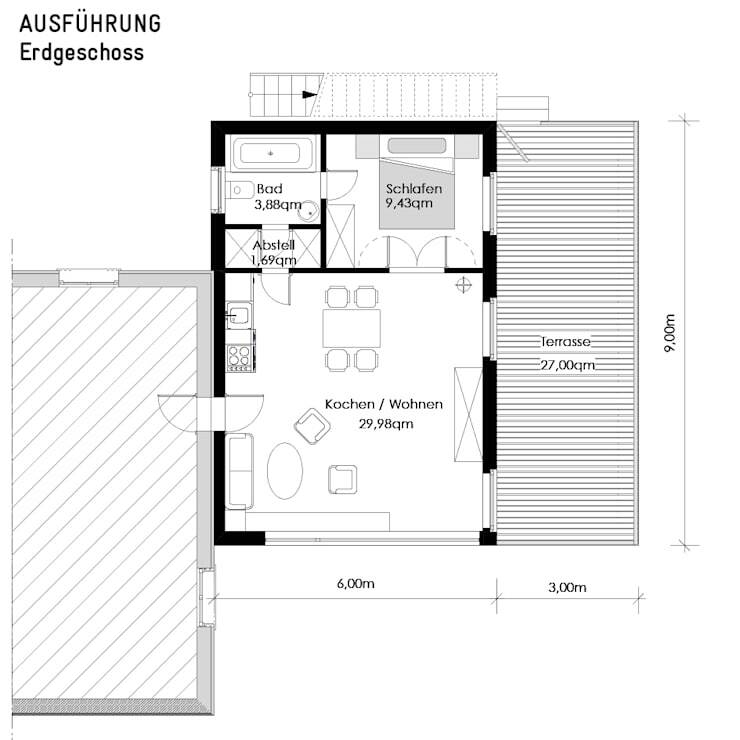 Note the generous width of the terrace compared to the width of the bedroom and study. This is definitely a home in which to enjoy the great outdoors. For more outdoor inspiration, have a look at Patio inspirations for every home.